Ever since YouTube acquired by Google, it has become an uncharted territory of Video Sharing. YouTube for eCommerce Marketing is very popular for Brands. It has become the new place for sharing news, media, and content. Let us see How YouTube using for eCommerce Marketing. Millions of hours of video are watched every month across the world and nearly hundreds of hours of video uploaded every minute. YouTube is available in lot of countries in no.of languages. Marketers realized the power of YouTube for promoting their brand and business and included it in their marketing strategies which proved to be beneficial. Based on the audience and the business, any business can use YouTube for their marketing purposes. There are different types of videos and various formats of YouTube marketing videos. Marketers can directly upload the ads made for television or for online viewers in their YouTube channels. The goals of any video marketing may differ. Brand awareness videos for YouTube help in spreading brand awareness among the targeted audience and might be successful in converting them as customers. Companies can use YouTube to live telecast their special events such as promotional activities or launches. Interviews with customers, CEO or product demo videos, reviews, behind the scenes are other types of videos that can be tried. These types of videos can be used by those who want their customer to get their doubts cleared. Create tutorial videos related to your service or product. Testimonials often can influence other prospective buyers to take a decision about making a purchase. YouTube is a great platform for uploading the testimonials about products. The first thing to do to plan a marketing strategy for YouTube is to determine who the target audience is. Based on their age, gender, geography or interests videos can be produced. Define the goal of the video marketing strategy. It can be to increase sales, connect with customers, show new product launches, clear the doubts of customers, etc. The performance of YouTube marketing videos measured by analyzing some target metrics such as click-through rates, video views, video shares, conversions, etc. Create a specific channel for promoting and marketing the products and services. Start producing videos based on your requirement. Do provide the link to your product page or the landing page of your e-commerce site in the description of the video so that people will visit the pages to know more about the product or service. The eCommerce marketer should know how to create a YouTube channel and upload the videos. Optimizing the channel is also important. Choose a channel name that reminds the viewers of your eCommerce site and is easy to remember. Place the links of the eCommerce site in different social media pages to attract the audience. Write a concise description and tell about your channel. Use the important keywords in the description. Choose a log that is relevant to your brand. Visitors will associate the brand with the logo they see on the YouTube channel. So choose a catchy, attractive logo with brand colours and characters. Channel cover phone must be unique and should be able to connect to your eCommerce site. Create content that will engage and entertain the audience. Provide them with the details of how to use your products, how to use the products and try clearing the doubts of the. Stick to your regular uploading schedule. Do not compromise with quality. Using subtitles in the videos is a great way to help people who watch the videos with no sound. Optimize the channel for mobile viewing a more and more people are now watching videos on their mobile devices. Make sure that people are finding your content. Use right keywords in the title of the video. Write important keywords also in the description of the video. Choose a thumbnail that attracts the visitors. Custom thumbnails will be more useful to get the audience click and watch the video. Analyze the performance of the channel and find what is working and what is not working. Make necessary changes whenever needed.Creating YouTube channel for eCommerce site is simple and easy. But creating content that performs is challenging. Some features can boost the performance of the videos. Follow some tips to increase the number of subscribers and views. Optimal length of any marketing or promotions video is less than ninety seconds. Go little over if you can make the video interesting. Product videos as these can convince the users to buy the product. Show the products in 360-degree video and explain how they work. List the specifications and show the response of the customers for the product. To boost the profile and to reach new potential customers, collaborate with influencers. Do not just focus on increasing sales, entertain the audience. Respond to their comments whether negative or positive. Getting audience drawn to the eCommerce store can be done in many ways. One of the effective ways is to use YouTube. People are accessing more and more online videos, and this is going to continue to increase. Create excellent content and attract the audience to the online store. Make videos that can persuade the prospective customers to make purchases. The most engaging form of content eCommerce marketing is Video. Here are the few best practices for applying video strategies for eCommerce stores. YouTube is continuously entertaining audience through different formats of videos. Most of the YouTubers watch videos through mobile devices and tabs. They wait for more than 20 videos continually one after another on relevant searches and playlists. Research the subscribers and audience strategy of watch videos how and from which source using. Understanding the audience is the key to eCommerce marketing, what type of content you are posting on Facebook, YouTube, and Twitter to promote product videos. Analyse the audience strategy through the demographic region, depending on the age and how much time they were spending on your video. Creating a playlist in YouTube channel is one of the best practices for YouTube Marketing. YouTube channel viewers engage with the subscribed channels and always grab the attention of playlist in the form of featured videos. Do SEO for YouTube channel videos adding correct titles, description and keywords increase traffic because search engine readily recognizes the YouTube SEO. Invest some time to respond to communicate with the audience through their comments and Feedback’s. Returns and give the reply to the audience build high audience engagement.Take feedback from the audience to identify the defects in your business and arrange a poll survey of voting the relevant searches. Apply YouTube video optimization techniques to the Videos. Use proper content, create appropriate videos for your eCommerce brands. Write titles, Description, and keywords for YouTube videos according to Google Search Algorithms. Add Call-to-action buttons to the videos to directly approach the brands, use Subscriber buttons, Subtitles, captions and small text buttons with your website links. Create Product videos to upload on your websites and YouTube channels. The Product videos should be unique, eye-catchy and innovative which describes the complete product details. Each product on your eCommerce store listed in the Videos. Suppose if you are selling electronics goods then you must introduce a video with new features on it. Upload and share your YouTube videos in social media links. It gives an opportunity to boost your audience growth; you will get the high endorsement for product videos.If your Video goes viral on social media, then you will get an opportunity to work directly with the YouTube stars and MNC’s. Include influencer in your eCommerce marketing. Influencer will boost up your product reach an audience and encourage to achieve high targets. Influencer promotes brands through videos and influencer campaigns. Encourage audience by your product videos on YouTube. Create your own YouTube channel for your Product. Launch the Videos whenever you launch a new product. The audience can readily recognize search with the product name. Create your product videos and upload in YouTube channels, then brand gets easily identified. Your goal is to convert audience to customers to generate income. Implement the video marketing strategies in e-Commerce videos. Implement all eCommerce video marketing strategies through Youtube videos. A product video is one of most recognizable in the YouTube Videos. Any user who wants to buy any product they must check for the review of the product and depends on working Procedure. User-generated videos are beneficial to the eCommerce stores. Because user-generated videos create the social identity among the users, They tested and proved the result of the product how it’s working. User-generated videos are unboxing videos and Product review videos. How to videos in an eCommerce play vital role in marketing brands. Customers always check for the How to videos to know to use the product and for configuration setting by watching videos. eCommerce store owner gets an option to bought product videos directly from brands to promote their products. eCommerce store has number brands in their shop so; they will get videos instantly from names to create the brand in customers. Over 20 million people search for the unboxing videos. One of the best way to get conversions through unboxing videos. Unboxing videos describe starting from opening the box, how to use it, installation, configuration settings and working procedure. Comparison videos describe comparison of two product by a customer’s. Customers rate their products and review by comparing two brands. Most of the customers compare the price, quality and working procedure for every product and go for better options. There is some Online eCommerce store to buy products online. 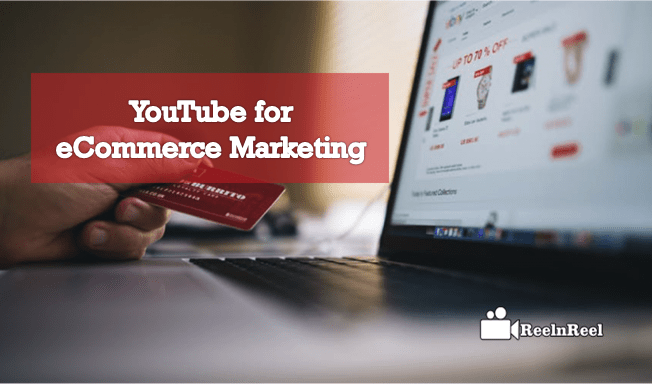 YouTube plays the leading role in eCommerce marketing; the above is an Ultimate guide for YouTube for eCommerce marketing.